The actress Adele Sandrock was the "primary rock" of the German movie in 20's and 30's. She was an actress through and through. When she began to storm on the screen or on the stage she was able as a dominant "dragon" to intimidate the strongest character, but she could also be cheering and tactfully. In the circle of the actors and actresses she was respectful designated as "Aunt Sadele" who knew how to tyrannize the environment in the movies as well as her private life with witty remarks. "I shall buckle on this monster? No, I won't! I will wear the dress on my breast, it will sustain!" Adele Sandrock got her acting education from her mother who also played for the theater. At the age 15 she made her debut at the Berliner Vorstadttheater Urania. The young Adele Sandrock had great successes on international stages in Berlin, Vienna, Moscow and Budapest in the following years. 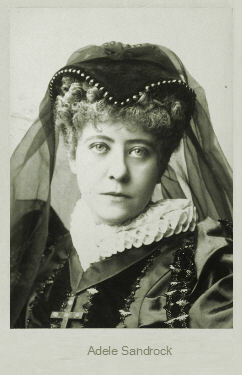 She became established as a great character actress with her engagement at the legendary Burgtheater in 1895. The new century involved a new sort of acting and Adele Sandrock didn't go down well with her obsolete performance. But this changed at the end of the 10's when she had great success as funny old woman because of her traditional style, the melodious speech and her grandeur. Adele Sandrock made her film debut already in 1911 in the movie "Marianne, ein Weib aus dem Volke" (11). It followed "Die Beichte einer Verurteilten" (15) and "Passionels Tagebuch" (16). From 1919 she was employed regularly for the film business. In the following 20 years she became an important figurehead of the German movie and impersonated more than 100 parts. To her most famous silent movies belong "Manolescus Memoiren" (20), "Lady Hamilton" (21), "Kinder der Finsternis" (21), "Dr. Mabuse, der Spieler" (22), "Lucrezia Borgia" (22), "Alt-Heidelberg" (23), "Die Waise von Lowood" (26), "Feme" (27), "Fräulein Else" (29) and "Katharina Knie" (29). In the 30's followed countless other box-office hits which maintained the myth of Adele Sandrock. To the milestones of her sound movies belong "Der Kongress tanzt" (31), "Der tolle Bomberg" (32), "Morgenrot" (33), "Die englische Heirat" (34), "Kirschen in Nachbars Garten" (35) and "Der Favorit der Kaiserin" (36). Her sister Wilhelmine Sandrock (1862-1948) was also a well-known actress.